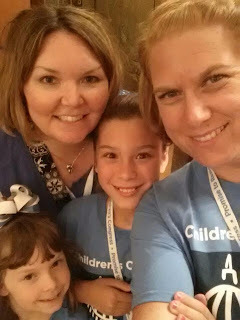 The Princess and The Pump: A Type 1 Diabetes Blog: Children's Congress: Awesome, Exciting, Inspiring! 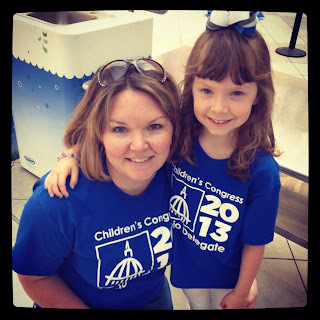 Children's Congress: Awesome, Exciting, Inspiring! 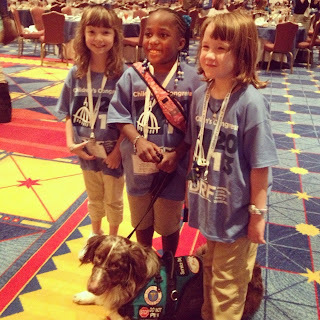 How can I possibly put into words what Children's Congress was like? So just know that no matter what I end up saying, it is not going to compare to awesomeness of the actual event. Like in no way. But I'm going to do my best to bring it to life for you. Because - IT. WAS. AMAZING. Sweets and I ended up being delayed out of our airport and coming thisclose to missing the Promise Song with Crystal Bowersox. For reals. We were over an hour late leaving, we got to DC and sat on the plane, we had to walk down steps from our plane to a bus - in the POURING rain, wait on that bus to get us to the terminal, wait on our luggage. I was all Amazing Race in the cab. "Get us to the JW Marriott AS FAST AS YOU CAN! Sweets ended up throwing her CC t-shirt on over what she wore and was quickly ushered in to get in her line to sing. I was a still a little harried from all that morning excitement so walking into this big ballroom with tons of cameras and lights and a stage and all these parents and kids... was overwhelming. As I stood there, looking around and taking it all in I thought to myself, "This is real. This is a big deal." It was to my advantage in some ways to have a little one. She was in the front row! I ended up getting to the other side and standing right behind the cameras so I could see. And wow. 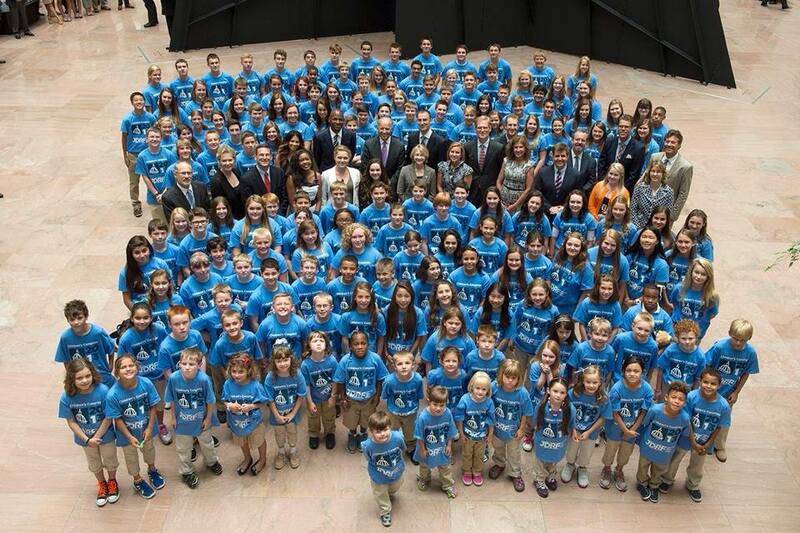 All these kids in their blue t-shirts. And then they started signing. I'm not sure anything can prepare you to hear 160 kids singing that song. It was pretty amazing. I wondered who the cuties were that she was standing next to. 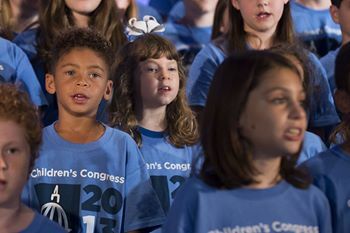 Later, I learned that the boy next to her was Walker, Ray Allen's son. When I told Sweets she said, "Oh. So that's why the other boy kept asking to meet his Dad. I thought it was just because he was SOOOO tall!" During the song, I was texting one of my blogging buddies that I have known for YEARS - but never met in person! After the song we did a beeline for one another! How great to share this experience with a good friend! Sugar and Wendy of Candy Hearts! Then it was off for state delegate pictures with Crystal Bowersox and Gary Hall! After that, it was time for the opening dinner! Sweets was thrilled to see hot dogs on the menu and I was thrilled to see carb counts in our folders! During the dinner, each delegate got up on stage to introduce themselves. It was so cute! After dinner, Sweets immediately made some friends her age. 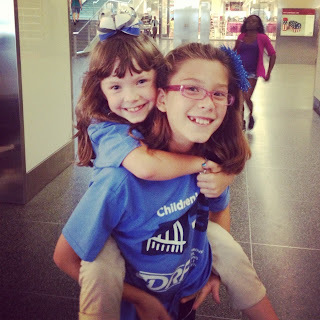 These girls spent the some time doing cartwheels and playing together! After a long day of waiting and being still, they really needed to get some energy out! 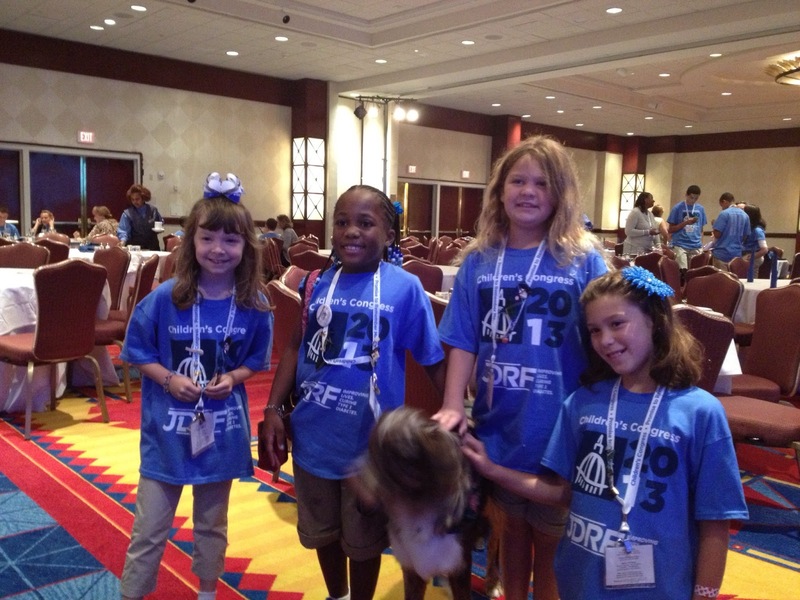 The second day was the role models town hall! 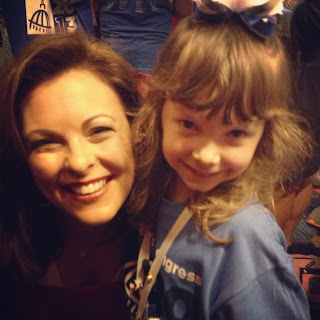 Sweets was excited to meet some of the T1 celebrities (so was I!). On the panel was Aaron Kowalski, Ph.D., chef and restaurateur Sam Talbot, broadcast journalist and writer Leslie Adkins, sportscaster and T1D dad Brian Kenny, Indycar driver Charlie Kimball, and actress Mary Mauser. I thoroughly enjoyed listening to the celebrities! The kids were able to ask them questions and they talked about living with T1 and accomplishing great things with the disease! After the town hall, the celebs hung around to take photos and sign autographs for the kids. They were all so gracious! I had to laugh at Sweets. A lot of the kids brought pins from their state or other items to hand out to the other delegates. I could not find reasonably priced pins so we made little cards with her picture on them and her email so she could stay in touch with new friends. That morning at breakfast, she went around with Sugar passing out their things. 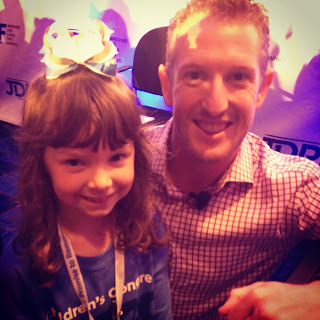 When it was our turn to get a picture with Charlie Kimball, Sweets handed him her card. He said, "Sweets! You already gave me one of these at breakfast!" I was like - "You already met Charlie?" And she was all, "Uh, yeah Mom. I've talked to him before. He was really nice." Oh, well ok! But that's exactly how ALL the celebrities were! After meeting them, the kids felt like they were buds. Sweets would say, "HI CRYSTAL!!!" every time she walked by. 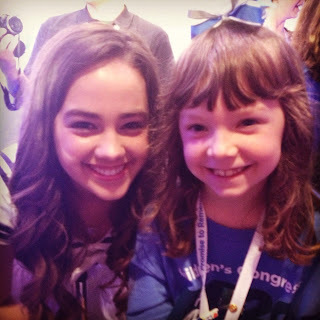 She and Sugar asked Mary Mouser to sit with them at dinner! It was so sweet! After the sponsor lunch, we had some time to hang out and talk in the ballroom. Wendy and I noticed Jeffrey Brewer, JDRF CEO and President, was available so we went over to say hello and see exactly what it was that he was showing people! What he had was a piece of new technology! This little thing is an encapsulation device that is implanted under the skin. See that little part in the middle? That's where the islet cells go! He told us that it had to be made out of special material with a special texture so that the body would not reject it and so no anti-rejection drugs would be needed. He also said that the T cells are larger than the islet cells so they would not be able to get it and destroy them! The device is said to last 18-24 months. He said he thought it might be in humans within a year. It was REALLY cool! Of course, Sweets said she wasn't interested in that because it meant going to the hospital for a surgery! However, she did think twice when she realized that it would also mean no shots or pumps or things like that! Mr. Brewer is very interesting to talk and listen to. I had heard him speak in person once before. He is super smart - but more than that - he's a Dad. He has a child with T1. So even though he may be the CEO of JDRF ... he has the same worries and hopes and dreams that the rest of us do. Every time I hear him, I can't help but think that we are in really good hands. 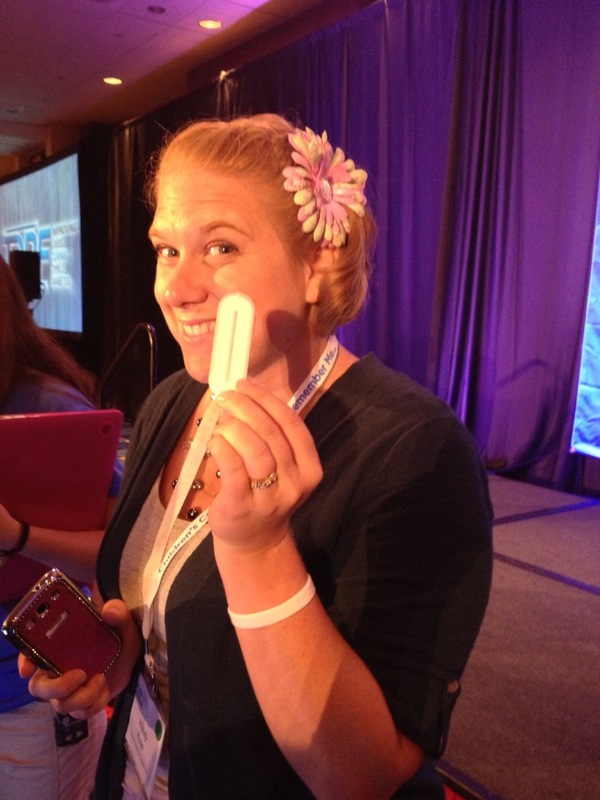 Who knows... maybe we were holding the future of Diabetes technology in our hands!!! We had our blitz training that afternoon to prepare us for our Hill visits the next day. 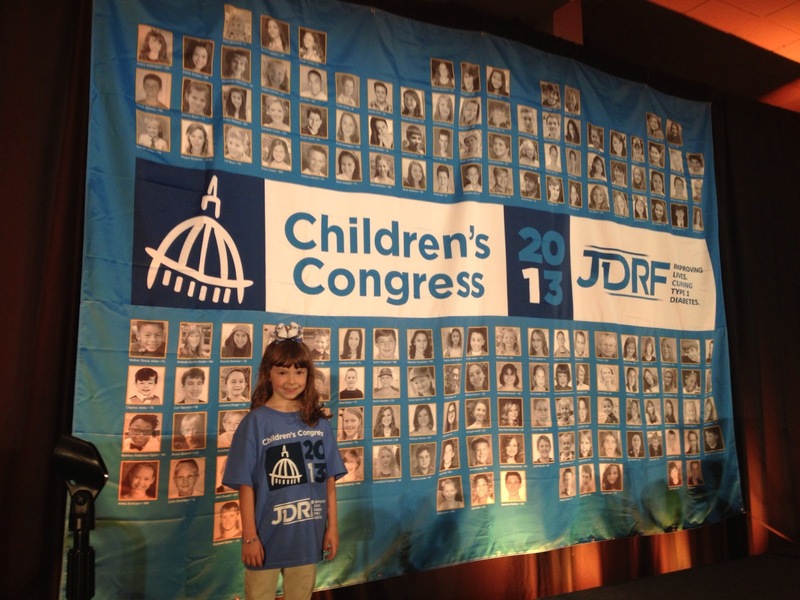 JDRF does an awesome job preparing you for these meetings. They make it so easy! That night we had on our own. We hung out with Wendy and Sugar. 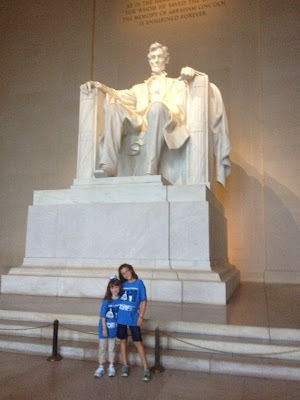 We went to the American History museum, rode the subway, visited the Lincoln Memorial, and did LOTS OF WALKING! Sweets did not care what we were doing as long as she was with Sugar! This was the day to go to Capitol Hill! We got up bright and early and picked up the scrapbook we had made for our visits. We had a later meeting so we hung out at the hotel for a bit and then took a cab over to the House side of the Capitol. 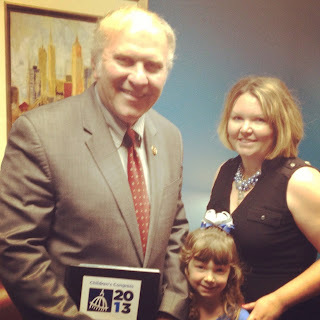 Our first meeting was with our Representative, Steve Chabot. We had met him a few years earlier when we visited for JDRF's Government Day. His staffer, who has T1, remembered us! He was happy to show Sweets his pump! We were thrilled that Representative Chabot took the time out of this busy schedule to meet with us! 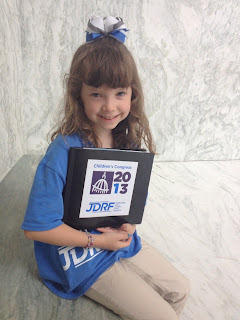 Sweets showed him her scrapbook and talked a little about what having T1D is like. We did our best to stress the importance of renewing the SDP and continuing funding for diabetes research. He seemed very interested in what we had to say and supportive to our cause! Representative Chabot has a niece with T1 so it is a disease that has affected him personally. After that meeting, we booked it over to the Senate side for our next meeting with Senator Rob Portman's staff. 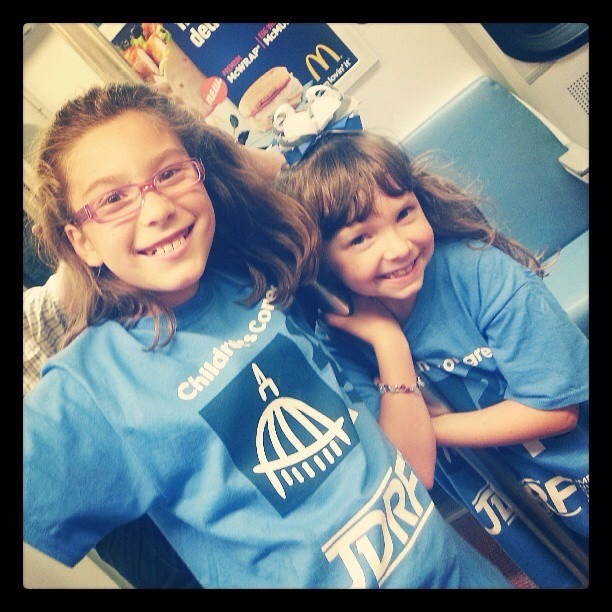 Posing as we walk past the Capitol! 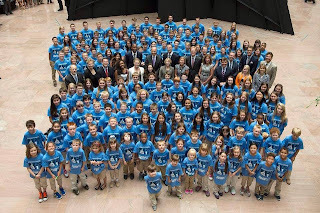 All of the Ohio delegates met with the Senators. This was a nice meeting! 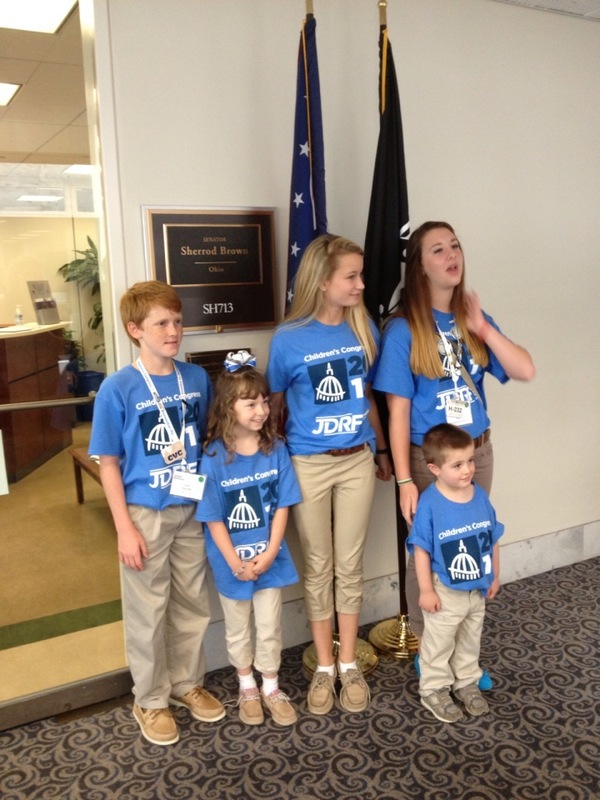 I really enjoyed seeing all the kids get involved and talk to the staff about diabetes! 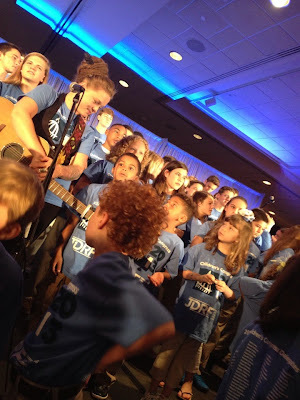 These kids are incredible - truly! We had representatives of all ages and they ALL did a great job! As soon as we were done, we had to hurry over to the Hart Senate building to have a picture taken with a special guest! Guess who it was?!?! 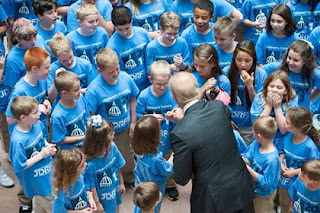 Vice President Biden! Holy cow!! The kids had to get in picture order again and they wanted the parents to move away and to the sides. No problem. Unless your T1 is low. All that walking was making Sweets LOW LOW LOW! In fact, LOW is exactly what her CGM was saying. She was really about 50 - not that that is so much better. Sweets was also a little nervous to be away from me. 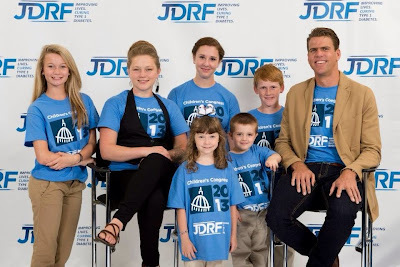 JDRF is on top of things. They have lots of helpers and medical staff right there to take care of these issues. I really didn't worry about her -- but she wanted me in her eyesight. And she was not the only little one feeling this way. So what's a Mama to do? Squish her body up against a potted tree and stay in her kids line of vision, of course! I had to laugh... This picture was scheduled at 12:30. Lunch time. We had not eaten. We had no time between meetings. I had packed some snacks but obviously not enough. And I was obviously not alone in this! You would see parents running in to the group from all sides with meters and juice boxes and pudding and tabs and food! That was a great feeling - everyone gets it. No one had to explain what they were doing. In fact, people kept saying, "I have a juice if you need it" "I have some snacks." "Do you need anything?" "What's her bg? How is she doing?" LOVE. 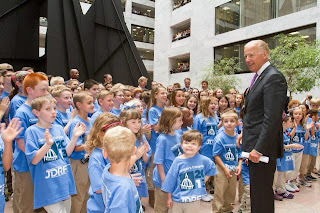 FINALLY, Vice President Biden entered the room! He walked to the front of the group and talked to the kids. He was so kind to the kids! Again, be small is helpful because Sweets was right up front! I was behind her but managed to get some shots of her and the VP! You can always tell it's her because of the bow! He was very encouraging to all of us! And he took time to take pictures with the kids. I'm not really sure what I expected, but he was very nice, kind and personable. I was impressed! See the bow on the left? Sweets! 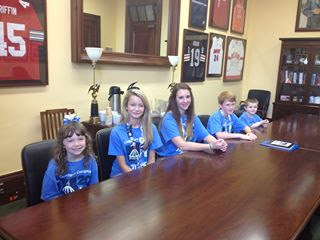 Next we rushed down to the Senate Hearing. I had to leave Sweets with the kids - which she was NOT happy about. Until she saw Sugar and then she was fine! We were jammed into that room! Sitting in the well at the Senate Hearing. We had to leave the hearing a little early to make our next meeting with Senator Sherrod Brown. We were really excited to have the chance to meet him! He shared with us that his son had been dxd with T1 as an adult. 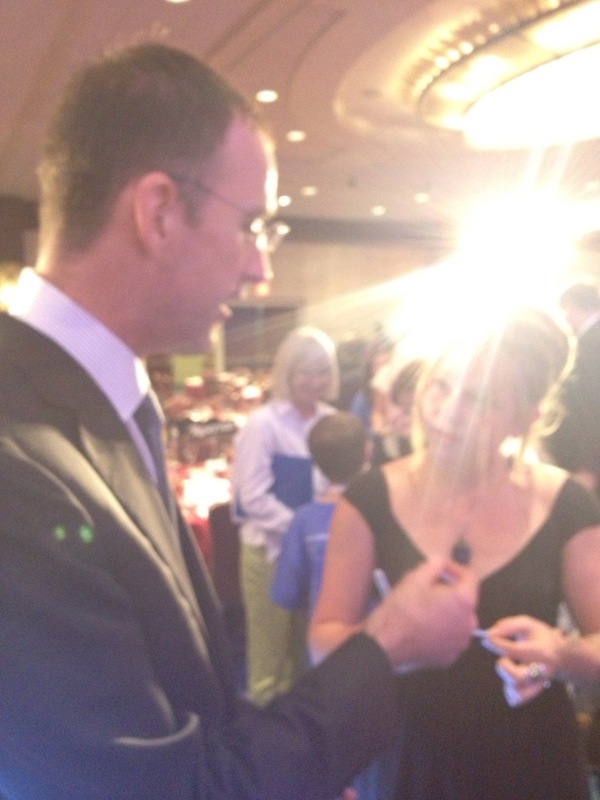 He very personable and kind to the kids! And he was VERY supportive of our message! 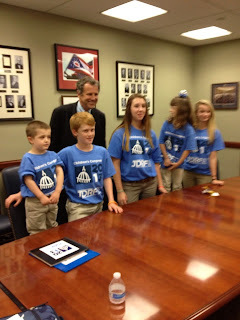 Team Ohio with Senator Brown. After that, our work was done! It was back to the hotel where Daddy was waiting for us to start our family sightseeing part of the trip! It was sad to say goodbye to the new friends we had made! It was so much fun and so exciting that it was kinda hard to come back down to real life! So I've told you all the facts about our trip. But what I can't seem to find the words for is explaining what it was like to be there and the emotions we felt. Awesome. Amazing. Incredible. Overwhelming. Priceless. Wonderful. Fun. Exciting. 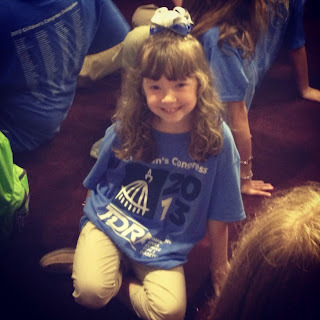 There is something about sitting in a room full of kids living with T1... just like your kid... that is pretty awesome. It's this major feeling of SAME. These people get it. They live it. You don't have to explain what you're doing. They're doing it, too. It's seeing your T1 immediately bond with the other kids. And not just the ones her age but the older and younger kids, too! It was like a family - even though we had just met. It was a feeling of HOPE. All these people are working toward the same goal we are. All these really awesome, smart, determined people! It was "Strength in Numbers". It was seeing your child using her voice to tell her story. 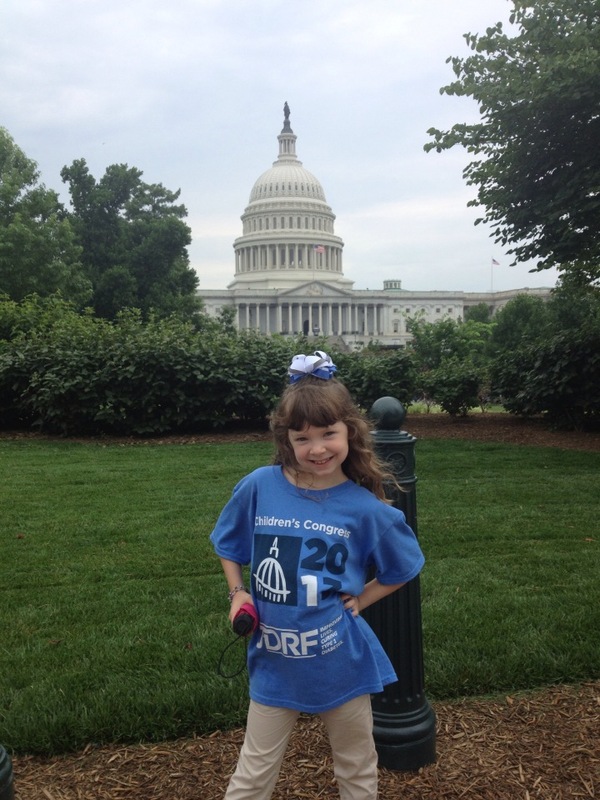 Seeing her empowered - not beaten by her disease. It was showing her that SHE can make a difference. Her voice counts. I moved to tears many times during our three days in Washington. Sometimes it out of awe. Sometimes it was out of joy. Sometimes love, understanding, overwhelmed-ness (is that a word? ), excitement, and happiness. 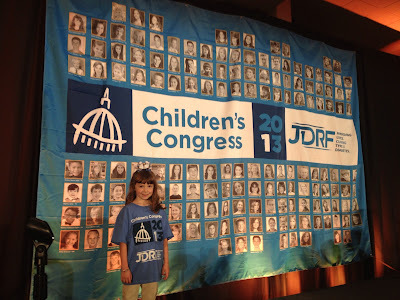 I want to thank JDRF for this once in a lifetime experience. 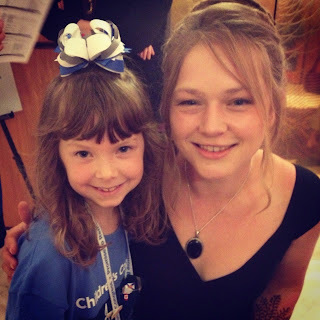 Thank you for making my daughter feel special. Thank you for showing her that she can make a difference. And showing that we ALL can make a difference. This is the best I can do. 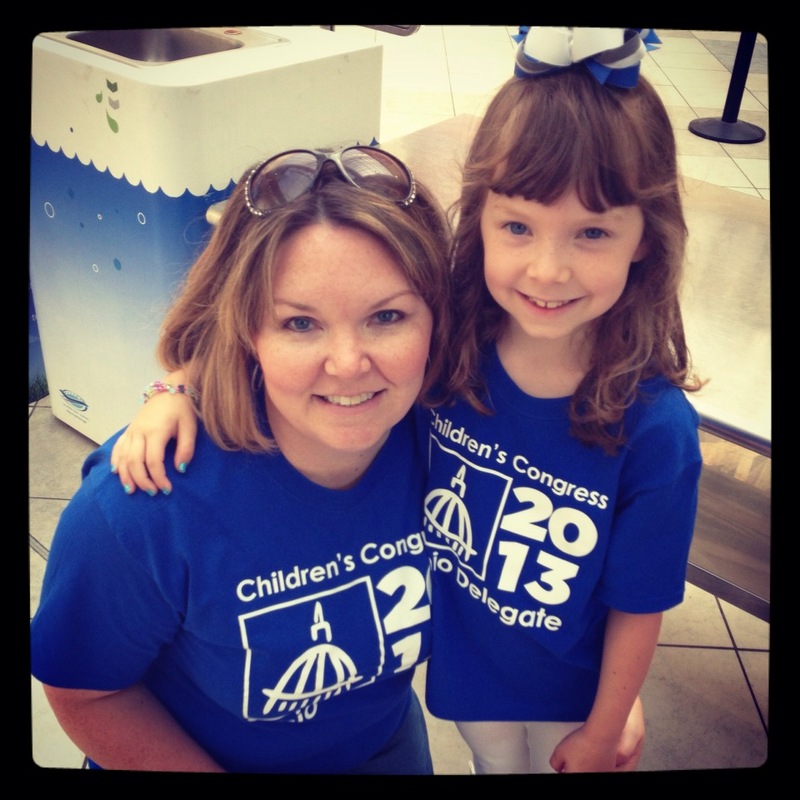 All I've got left is to encourage you to apply for CC15 and go experience it yourself! And until then... get involved. Become an advocate. Attend your local Promise meeting. (We are!) Make a difference. The same-same parts of these events is always what brings tears to my eyes. So glad you guys had the chance at this!!! WOW! That was only 3 days!!?? Im so happy to hear you had a great time!! If there was anyone in the DOC I'd like to send to represent us, it was 100% Hallie and Sweets! Love you guys!! So amazing! What a great chance to show strength in numbers and to feel the support of so many. Totally need to look into CC15 for Bean! Wendy let me look through her pictures when we were at FFL and I loved looking through all yours here too and hearing your take on all the events. So awesome!!! Love all the pictures, and J is determined to go next year. How awesome if we were all together!? 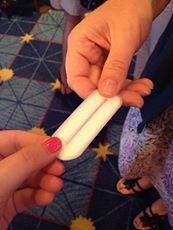 Great that the legislators were supportive, and the picture of the implant gave me chills - who knows what might be available 5-10 years down the road?